The media calls us one of the most fun things to do in Calgary. We’re flattered! Since our grand opening, news outlets big and small are calling us one of the best new things to do in Calgary. Here is a partial list of media mentions. 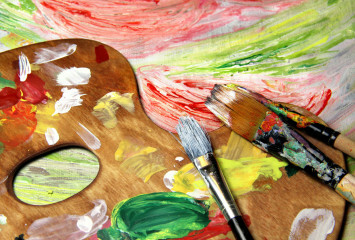 To book your own paint and sip session- check out our schedule. Tuck into savoury appetizers as you go from blank canvas to finished product within a few hours at Calgary’s first paint and sip studio. Nights are reserved for classes that are ideal for a girls night out or a date night. Kids can join in on Saturday morning sessions, and on Saturday afternoons the studio can be rented out for children’s birthday parties. Parents can drop their tots off or hang around while nursing a glass of wine. Sure beats laser tag. Click here to read the full article in WestJet Magazine. What could be better than getting together with some friends, having a glass of wine, and painting a masterpiece – or not?! Vin Gogh lets you do just that. Owners Brenda Mahoney and Loretta Gotmy came by the studio to tell us more. Patrons can spend an evening enjoying some wine while learning to paint thanks to a new venture from Brenda Mahoney and Loretta Gotmy of Vin Gogh paint-and-sip studio. Here’s what they said about us! The official website for things to do in Calgary. Features attractions, festivals and much more. One of the best fan sites for Calgary, Calgary Is Awesome offers profiles of what’s hot and happening in the City of Calgary. A website dedicated to connecting Calgary through the arts. Best Birthday’s featured us as a great way to entertain and celebrate birthdays. Local radio station visited us on opening night. They called us “A true gem” among things to do in Calgary. If you’re looking for fun things to do in Calgary, look no further! Vin Gogh Paint & Sip is a great way to connect with friends, no matter the occasion. 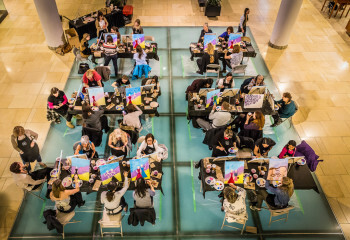 Whether it’s date night, girls night out, your corporate team builder or for a unique birthday party idea Vin Gogh combines three of life’s greatest pleasures: Wine, Food & Art!